So, when you get to my age, when you're exactly like me, you begin losing interest in new music--that is, music that's new to you. It becomes a chore to explore everything about new bands the same in-depth way you did in your energetic youth. And when you do find something you really enjoy, you feel shades of embarrassment that you didn't know about it sooner or regret that you weren't exposed to something that could have changed your life at an earlier time before it all started going wrong. And you are so often afraid or accused of being pretentious, that to talk about music you find genuinely interesting is paralyzing because you assume people will assume you are simply referencing something truly melodic and mood-bolstering as a way of indicating your own intellectual hyper-development. But lately, I have been investigating a slew of jazz recordings. In the early days, I listened plenty to Louis Armstrong and Billie Holiday. 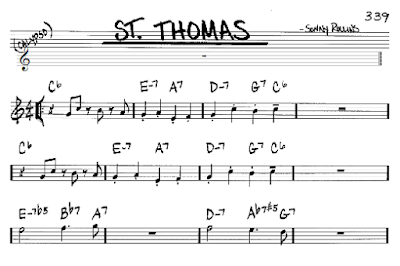 This recording below, Sonny Rollins' "St. Thomas" is fantastically catchy. I am not a musician by trade or by my own admission, but even I can appreciate the skill in creating rhythmic texture, specifically Max Roach on drums. The top melody is wonderful and memorable, reminiscent even of something Satchmo may have scatted in some long forgotten session. It has an upbeat tempo and liveliness to it, so much so that it could possibly be subtitled "When Deez Nuts Go Marching In". Anyway, I'm really enjoying this new world of music that I've never more than scratched the surface of and then immediately applied some antibiotic cream to. You're welcome along, musicians and non musicians on what I hope will be a completely honest, unthreatening and unpretentious look at a style of music so independent and ever-changing, it could even be considered its own stand-alone artform. I wanna make this a dialogue about things we love, so feel free to share some urls below in the comments section.